Award-winning SEO certification workshops since 1997. SEO is one of the hottest topics shaking up the web design and development industry. It is no longer acceptable to simply build a website and hope people find it. The key is to develop an optimized website that attracts target market visitors and makes the sale. Our SEO classes provide the training you need to succeed. We’ve even trained many other SEO companies in Montreal! Our workshops cover beginner basics to intermediate and advanced skills. There’s an art and science to writing for people and search engines. We’re WordPress design, programming and troubleshooting experts. SEO expert Brian Rotsztein always includes humour whether he’s working one-on-one with a client or training hundreds of people at a conference (like this one!). We gave our first SEO training seminar in Montreal in 2004 and continue to provide professional training for web designers, business owners, and corporate website development teams. Our SEO training represents the best in the industry. From conception and strategy through implementation and results, we will teach you our in-house trade secrets. Our training approach is unique and has been honed and customized to ensure that the information is useful, fresh, effective, and up-to-date. I’m new to SEO, is this seminar for me? Yes! We cover everything you need to know. Our trainer is friendly, helpful, and full of knowledge and ideas to help you get the most out of this learning experience. Can I ask questions about my own website? Yes! We encourage you to ask questions to better understand the topics being explained. We can use your website in our examples to ensure you get the most out of the session. 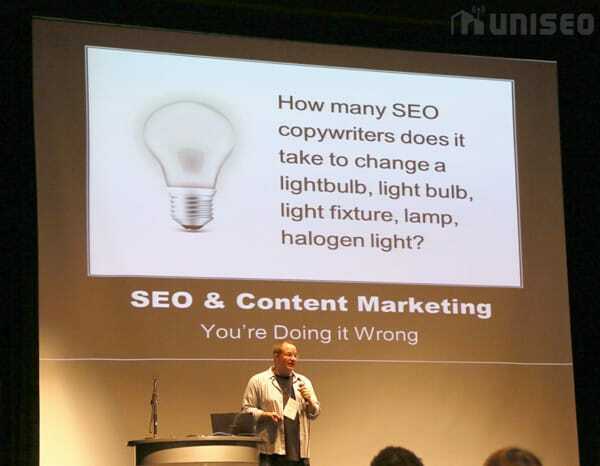 I already know a bit about SEO, is this seminar for me? Yes. We cover more advanced techniques and provide deeper explanations and examples as needed. Does the seminar cover Content Marketing, PPC (Pay Per Click), WordPress or other topics? We may touch on those issues as they relate to SEO. Do you offer a separate PPC training seminar? Yes. It is a shorter session which is scheduled based on demand. Do you offer a separate content marketing workshop? Yes. It is one of our most popular workshops. Learn more about the content marketing course. Your SEO trainer will be an actual award-winning expert who has taught hundreds of university students to high acclaim. He now performs Internet marketing training and consulting on a full-time basis. His coaching and work has given his clients the opportunity to make millions of dollars online. He takes complex ideas and breaks them down into concepts that are easy to understand. No other search engine optimization company can say that an actual university professor has set up an extensive, professional SEO training workshop program such as this. When is the next SEO training class? Please visit the full schedule. Still not sure? Consider that Uniseo is the most consistent SEO company, with an incredibly high success rate. We teach you our trade secrets in our workshops. Read our 100% real testimonials, look at our client rankings, and you’ll see that we are among the top search engine marketing training companies in the world. In addition to our SEO training services, we provide professional one-on-one and on-site SEO training as well as search engine optimization consulting. The choice of service depends on your specific needs. Please contact us for more information and thank you for taking an interest in our company. Questions? Concerns? Want to get started?